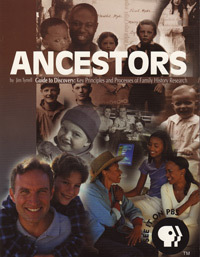 ANCESTORS – Guide to Discovery: Key Principles and Process of Family History Research was printed as a companion book to the “Ancestors” television series produced by KBYU and run on the PBS Television Network. A decade later it is still one of the very best “getting started in genealogy” books available. Beautifully produced, the volume covers the basics of getting started in genealogy in a very visual format. The book takes the user step-by-step through the research process, and includes the standard forms used for genealogy.